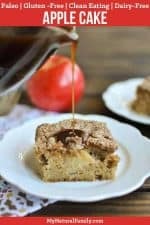 Make this Gluten and Dairy-Free Apple Cake that is light and fluffy and sweetened with fresh apples and pure maple syrup. It is perfect for breakfast or dessert and is clean eating and Paleo friendly. Three very simple and basic fruits that you can usually find year around – although apples and oranges are better when they are in season. Of course, I love all fruits, but these three are my top three…so naturally, I like to include them in my recipes. I especially love apples and fall baking, they just go together perfectly – wouldn’t you agree? Since they go together so well, I thought I would share this delicious Paleo cake recipe with you! It’s the perfect combination of fresh apples and fall baking, and when it’s in your oven baking it makes your house smell insanely yummy! 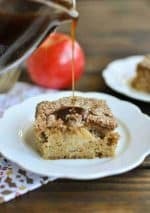 This Gluten and Dairy-Free Apple Cake is light and fluffy and sweetened with a little bit of pure maple syrup and fresh apples. It’s light enough to eat for breakfast, a snack, or a light dessert…If you want to make it a more decadent dessert, feel free to add a little bit of homemade Paleo caramel sauce. It takes this simple Gluten and Dairy-Free Apple Cake to a whole new level that makes it downright addictive. As an added bonus, this cake is clean eating and Paleo friendly. Made with high fiber coconut flour, you won’t feel guilty at all when you decide to eat cake for breakfast :). I would love to know what you think of this, so please comment below!